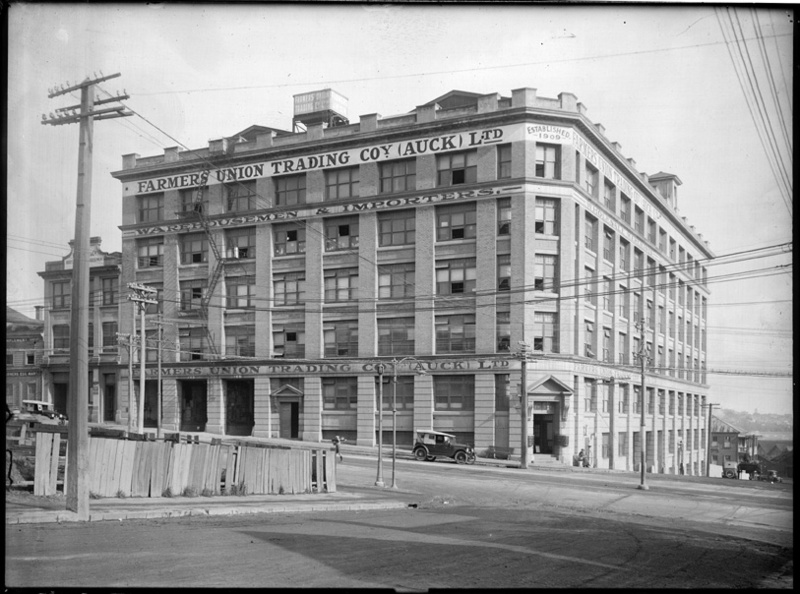 The Farmers Union Trading Company started at their Hobson Street premises in 1914 as a head office, then converted their premises to a department store from 1920. Next to their site, a jumble of wooden buildings was transformed from 1928 into what is described by Ian Hunter in Farmers - Your Store for 100 Years (2009) as "the first free car park in Australasia," which opened with a large banner over the entrance, and space for 88 vehicles. Farmers even opened its own service station in conjunction with the carpark, the "Lubritorium," offering customers service while they shopped; discount petrol for shoppers during the 1930s with proof of purchase, "for every £1 spent in store they got a gallon of petrol for a shilling." 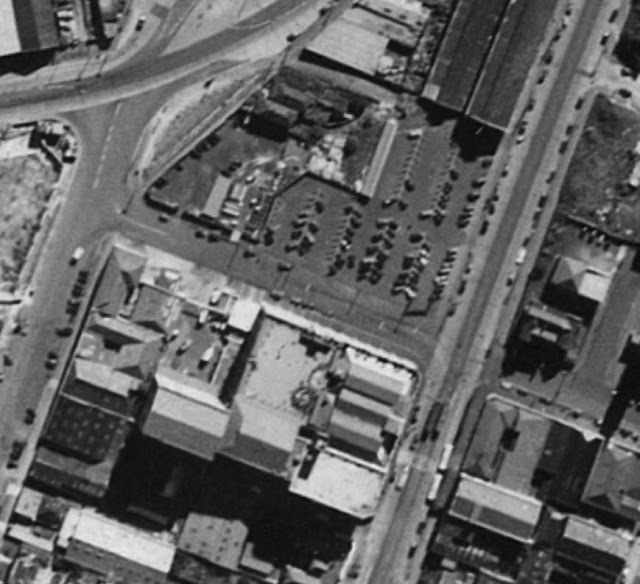 1940 aerial, showing Faremers' open carpark area. Auckland Council website. The carpark was extended for 160 vehicles by the 1950s, but this still proved inadequate. 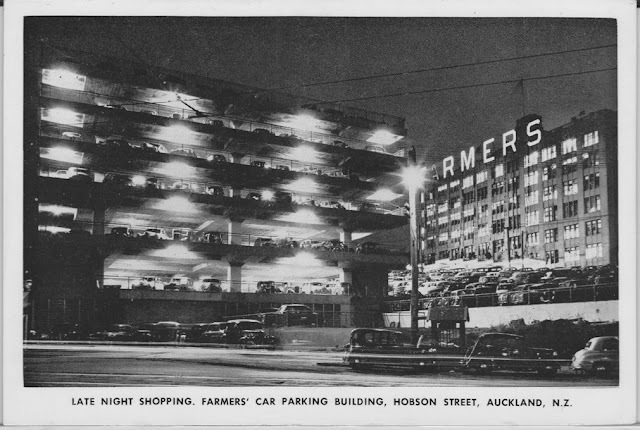 So, in 1955, Farmers opened its first multistorey carpark building, at a cost of £200,000. These two postcards I purchased this week may come from around this time. By the late 1960s-early 1970s, the area in the foreground seems to have been converted mainly to gardens, judging by images in Hunter's book. According to Hunter, "Elegantly attired hostesses took customers' money and directed them to a suitable park." A drive-in movie and burger bar operated from the top floor. The building was doubled in size in 1962, with a skyway constructed linking the building with the main store. It remains to this day (operated by Wilson Parking), even though the department store it once served is now a hotel since 1996. 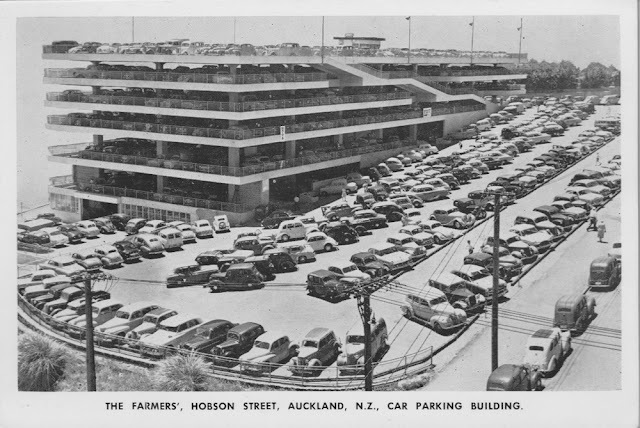 I was a small kid when the carpark opened, but I still remember the stir it caused, maybe even more than Farmers' other great 1950s innovation, the first escalator in Auckland! My parents used the carpark quite often and, despite the "standing room only" fullness depicted in your postcards, I remember it was often quite empty during the day. It did brisk business on Friday nights, when "town" was still a magnet for shoppers and nothing was open on weekends. Escalators! Mum wouldn't go near them, for fear of getting caught up and being bodily injured (a phobia from her days as a kiddy in Britain). I had to train myself to use escaltors once I was an adult. But yes -- Farmers installed escalators in 1954, originally planned for just three floors, then extended to serve every floor. At the special event for the switching-on, 850 people arrived to watch them move for the first time (according to Hunter). Thankfully for my childhood memories of seeing more than just the ground floor at Farmers, they did update and mnaintain the lifts. The carpark pictures definitely gave me a flashback to Friday night shopping. I remember the 'skywalk' being thrilling when I was little.